Wiley, however, assured us that such a grandiose scene was never in the cards. The portrait instead shows the 44th president pensively seated in a chair surrounded—and sometimes obscured—by foliage that provides a botanical mapping of his life. 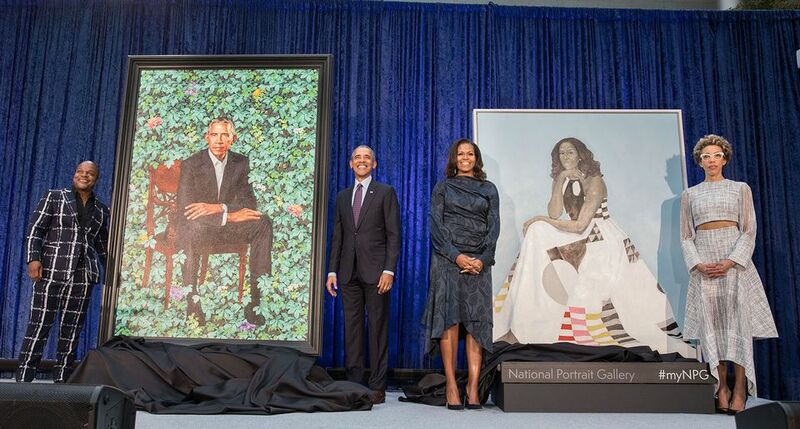 Kim Sajet, the director National Portrait Gallery where the painting will join the historic collection of presidential portraits, surprised her staff by quickly recognising the flora in Obama’s painting. “I’m an avid gardener so I knew, ‘Oh, that’s an agapanthus,’” she said. African blue lilies reference Obama’s Kenyan father, jasmine represents Hawaii, where he grew up, and chrysanthemums, the official flower of Chicago where he started his political career as a community organiser, appear as well. The Baltimore-based artist Amy Sherald, who painted Michelle Obama’s portrait, was equally emotional while thanking her mother at the event. She also spoke movingly to Michelle about how she inspires others. “What you represent to this country is an ideal, a human being with integrity, intellect, confidence, and compassion,” Sherald said. She explained that the portrait, which depicts the former first lady in a billowing dress designed by Michelle Smith, draws on the colour scheme and grids of the painter Piet Mondrian and the geometric quilts made by the women of Gee’s Bend in Alabama. Noting that the unveiling took place on Abraham Lincoln’s birthday, David Skorton, the secretary of the Smithsonian Institution, said that the 16th president credited a portrait by Mathew Brady with helping elect him. While Skorton added that there were likely some other factors at play, “presidential portraits have a particular power to capture the public imagination,” he said. In this case, it is doubly historic, as it is of the country's first African American president by the first African American artist commissioned to paint such a picture. The lasting imprint of this particular presidential couple could also be seen in the flood of media coverage that followed the portraits’ unveiling. We had just finished our interview with Wiley when a handler whispered to him that he was trending on Twitter—ahead of Barack Obama.